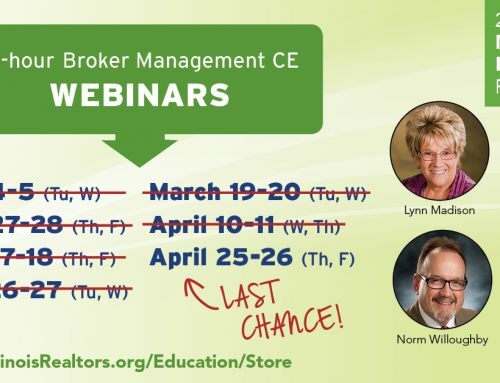 IAR’s Applied Real Estate Principles webinar next Thursday and Friday may be the answer to your continuing education needs if you’re a real estate professional working toward your broker’s license. Convenient registration options include phone 800-523-5077, online https://iar.webex.com/mw0401lsp12/mywebex/default.do?siteurl=iar&service=7 or email education@iar.org. Avoid the snow and ice by taking the 15-hour, two-day webinar from home. The instructor, Norm Willoughby, is a sought-after speaker who’s trained thousands of real estate professionals. Make your own coffee and help yourself to refills. The cost is only $159. The course is required before taking the state licensure exam. More about our instructor – Willoughby is also a licensed real estate managing broker and auctioneer. He served as assistant commissioner for the State of Illinois Real Estate Professions Bureau, Office of Banks and Real Estate, from 1995 to 2003. Since 2003, Willoughby has served as Chief Executive Officer of the Decatur Association of REALTORS®. Since 2012, he’s also served as the Chief Executive Officer of the Central Illinois Board of REALTORS®.